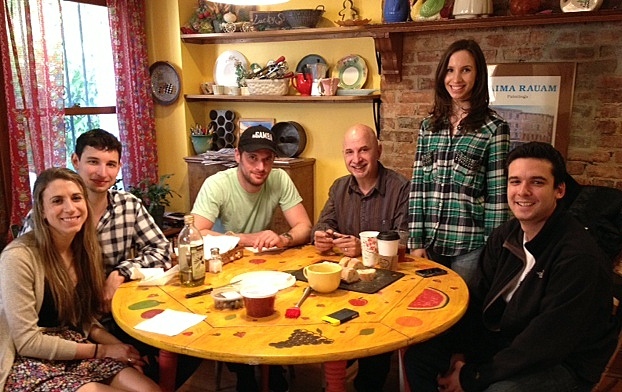 My eagerly anticipated relaxing (read: no plans) Memorial Day weekend changed as suddenly as the weather when, on Sunday, the DH and I found ourselves with a household of hungry dinner guests. 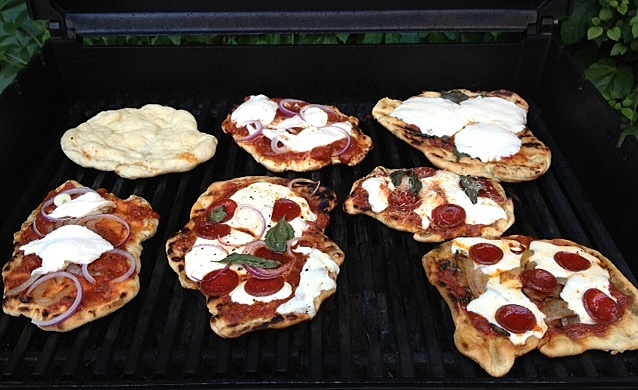 Having gotten wind of this invasion at noon, I prepared a batch of pizza dough to rise through the afternoon (and to grill later). 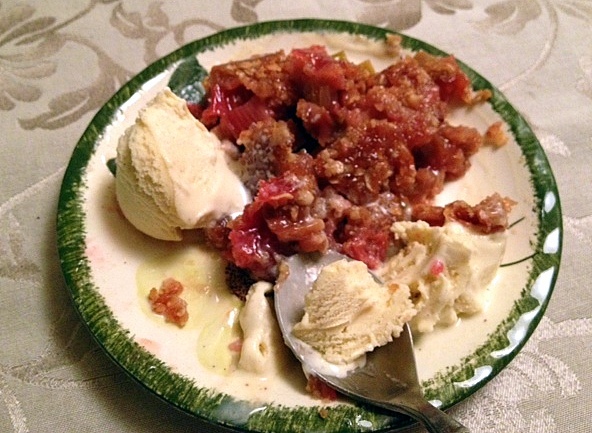 Dessert was no problem -- I was planning on making rhubarb crunch anyway and now I'd have a lot of eager eaters. 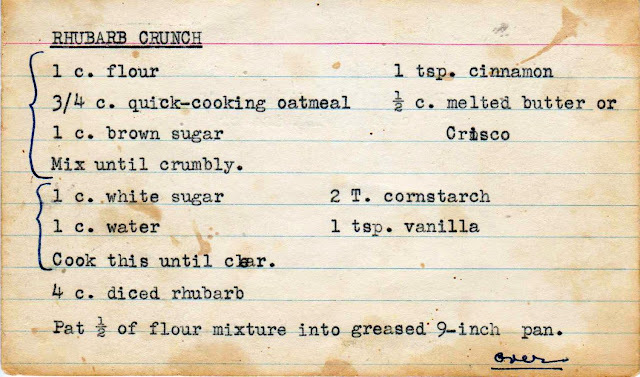 I have three recipes for rhubarb crunch in my collection; I selected the one that seemed the oldest, probably from the 1940s. 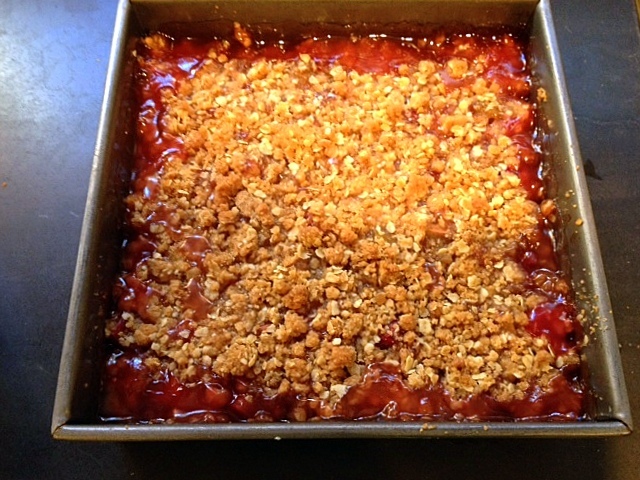 It's a three-layer dessert -- a pie-like filling layered between a base and top. This is really, really good and made a lovely breakfast treat the next morning. Start by making the base and top -- which are made from the same mixture. 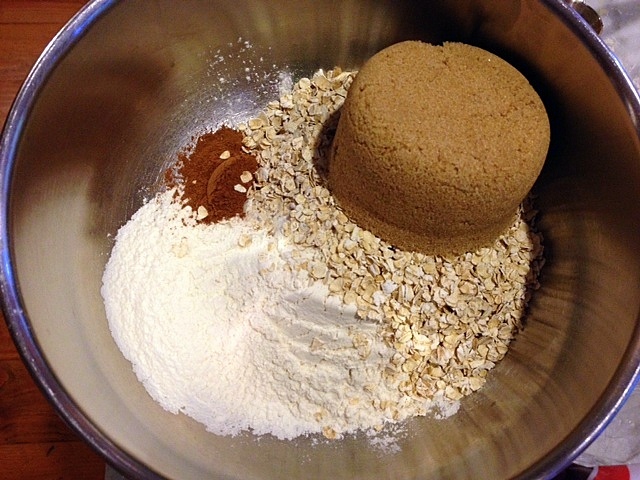 Combine raw oats, brown sugar, flour and cinnamon. Add in one stick of melted butter. 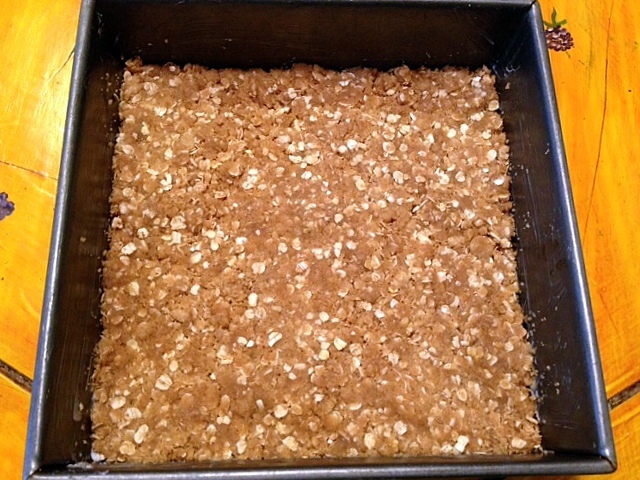 Press half of the mixture into a 9 x 9 inch pan, which has been well greased. 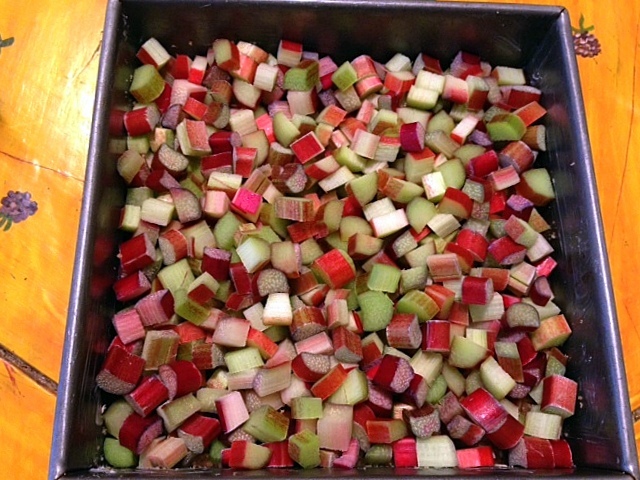 Next, place four cups of diced rhubarb on top of the base. 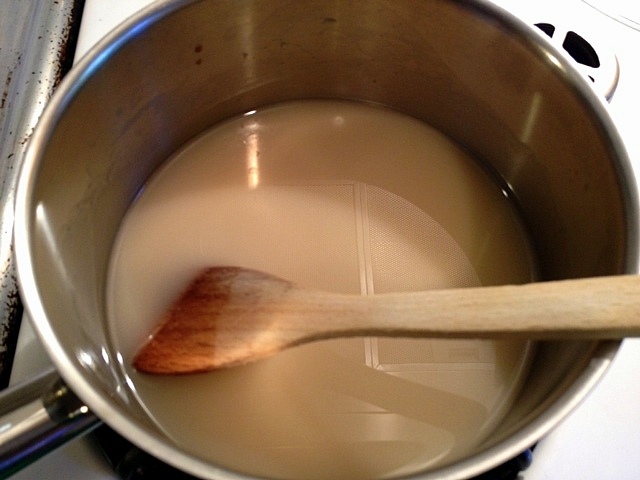 Now, prepare the sauce -- a cooked mixture of sugar, water, cornstarch and vanilla. 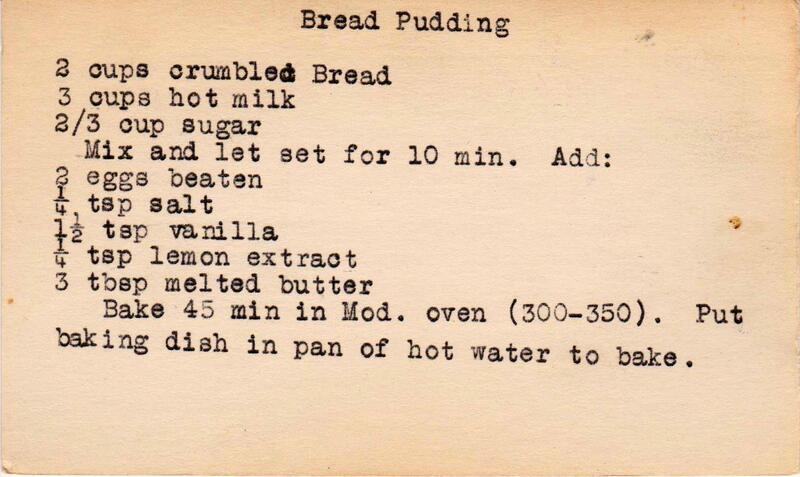 Although the instructions say to cook until it is clear, it never did get clear, perhaps on account of the vanilla. 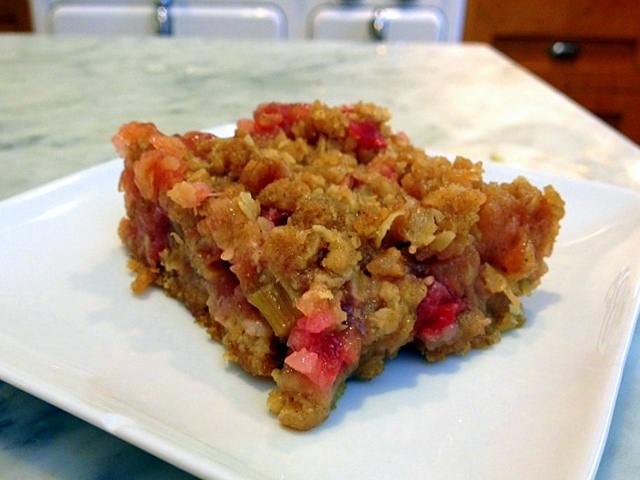 I just cooked it until it was somewhat thickened and then poured it over the rhubarb. 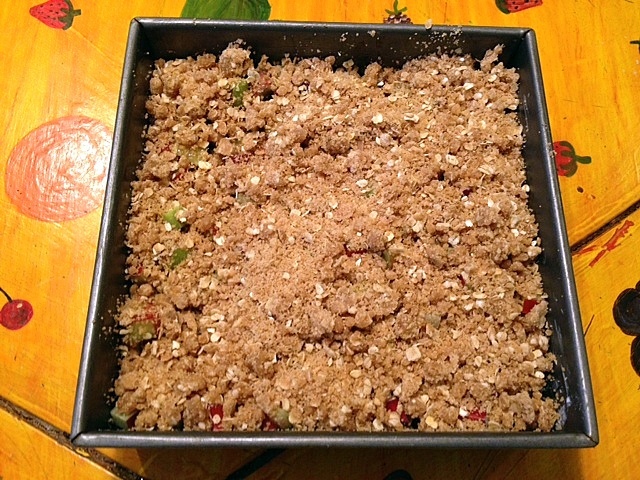 After the sauce is poured, place the remaining oatmeal-sugar-flour mixture on top. Bake for one hour. Pull from the oven and let cool. Rhubarb is one of those truly seasonal vegetables and, despite the wet and windy 45 degree temperatures in New York today, there are plenty of these red stalks at the farmer's market. 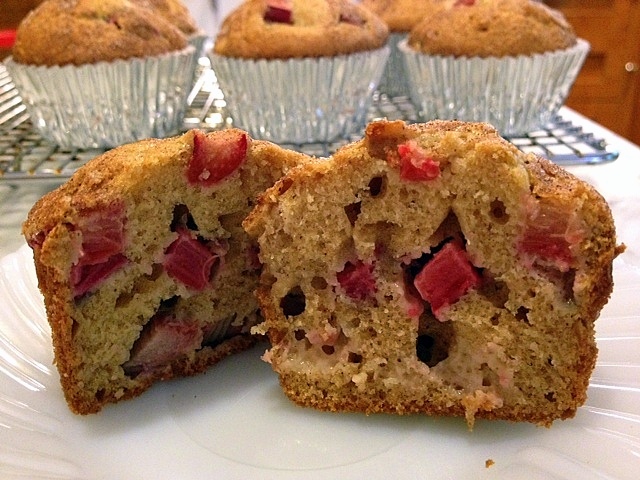 So how better to warm up the chilly kitchen than to make these moist and delicious rhubarb muffins? 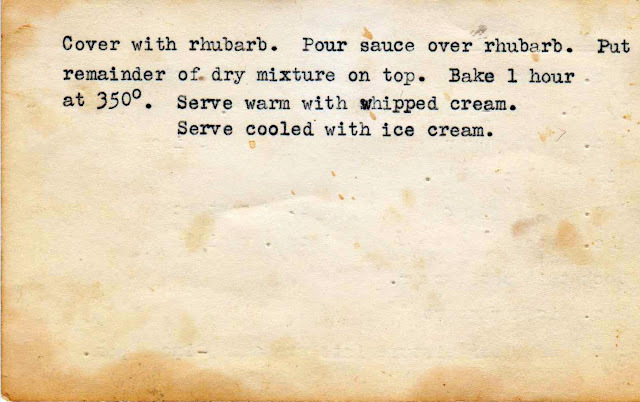 I have a lot of rhubarb dessert recipes in my collection for, while it has fallen somewhat out of favor these days, in the early- to mid-20th century -- before all manner of imported fruits were available year round -- rhubarb figured big into springtime desserts. It is is naturally sour, and needs to be cooked and sweetened before eating. 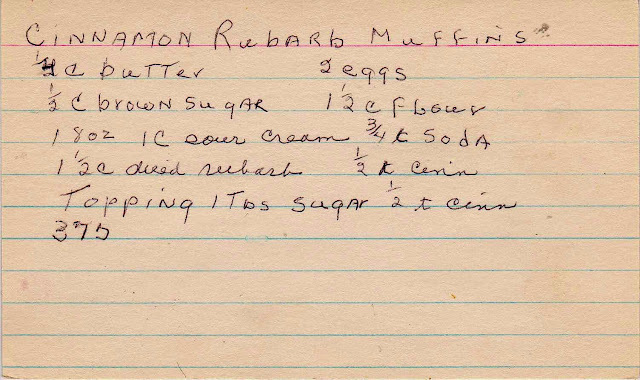 The handwritten recipe is quite cryptic, so I've included the method I used. These are simple to make and are not overly sweet. 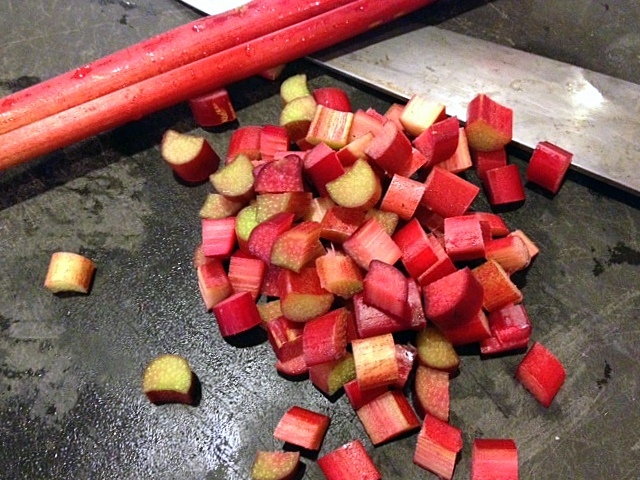 In fact, the rhubarb is quite tart and provides a very bright note. 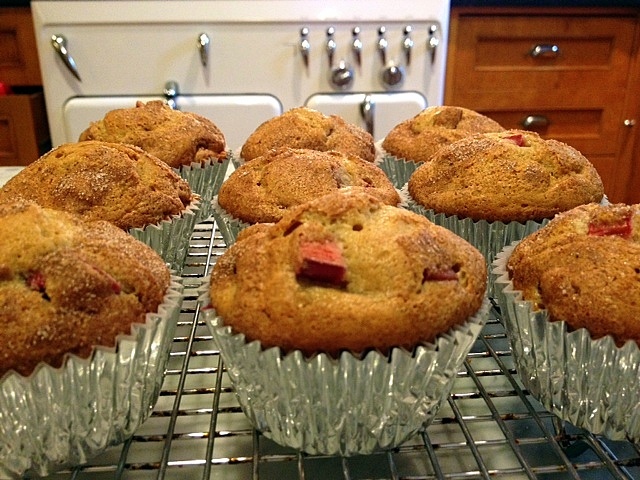 The muffin batter is delicious and rich (the addition of sour cream is lovely), once again proving my theory that muffins are simply an excuse to eat cake in the morning. As if anyone needs an excuse. 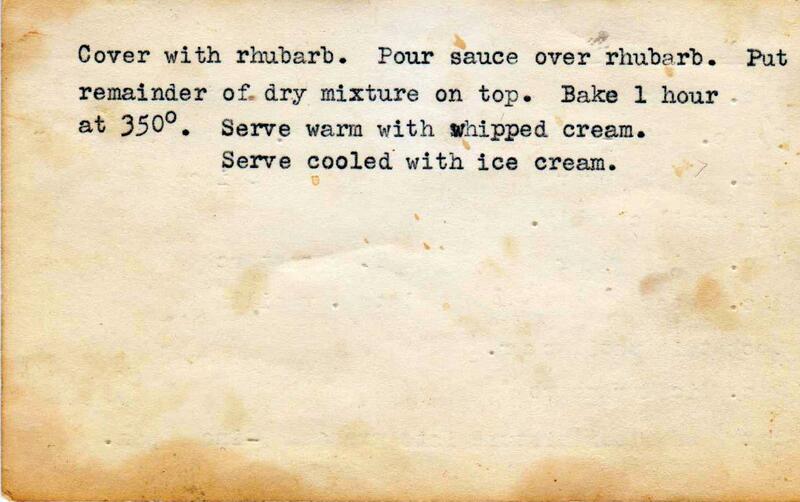 First, dice up the rhubarb. You'll need 1.5 cups. Then, if you're like me (unprepared) run to the corner store to get the sour cream. Adding in the sour cream, below. 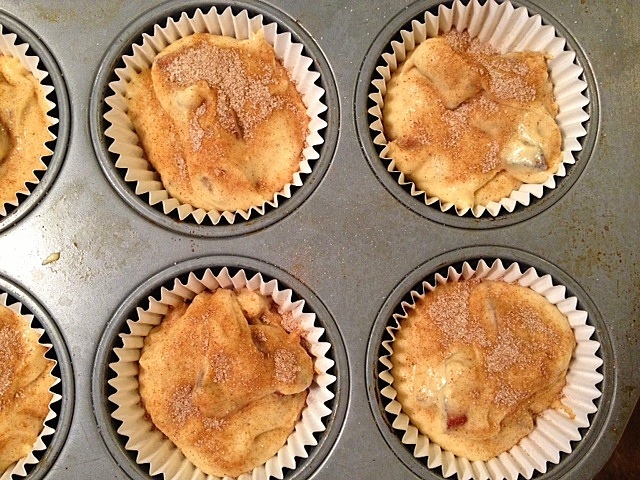 Spoon the batter in paper-lined muffin tins. Don't worry about the uneven appearance -- they will rise into perfectly shaped domes as they bake. The recipe calls for sprinkling a cinnamon-sugar mix atop the batter. Don't skip this step, as it adds some needed sweetness and beautiful color. Cool the muffins on a rack. 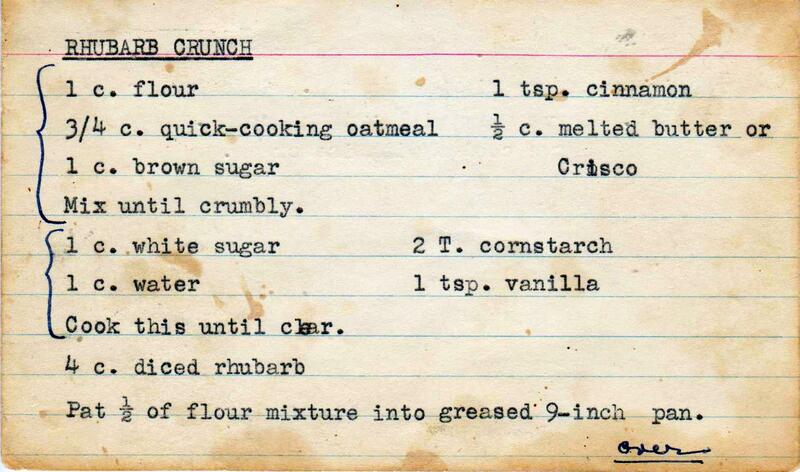 The recipe card (just a list of ingredients, really) is below, followed by more detailed instructions. Preheat oven to 375 degrees. Prepare one 12-muffin pan. Cream butter and sugar until well mixed. Add eggs, one and a time, mixing between additions. Combine flour, cinnamon and baking soda in a small bowl. 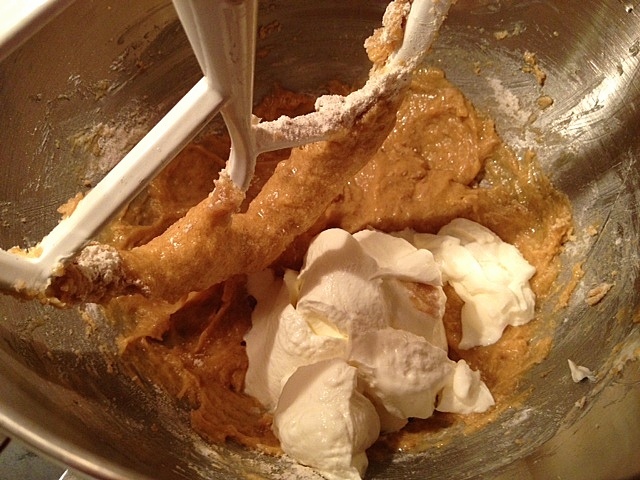 Add 1/2 to the batter and mix. Add the sour cream and mix. Add remaining flour mixture and combine until well blended, taking care not to over mix. 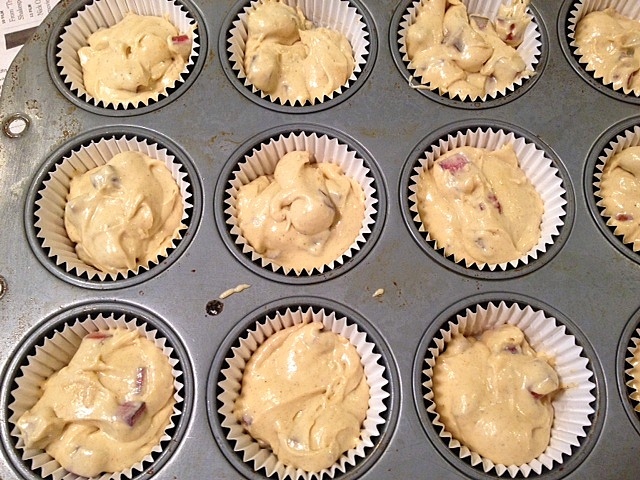 Meantime, combine the topping ingredients and with your fingers or a spoon, sprinkle on top of batter. Bake for abut 20 minutes. Makes 12 muffins. I'm back, after far too long away from my oven. One reason excuse is that the DH and I spent a week in Paris, swapping apartments with a French family we "met" on craigslist.org. We'd done this before and, like the last time, I returned to the surprising food remnants of the Parisians' stay in New York -- supermarket white bread and other items that I would never purchase. 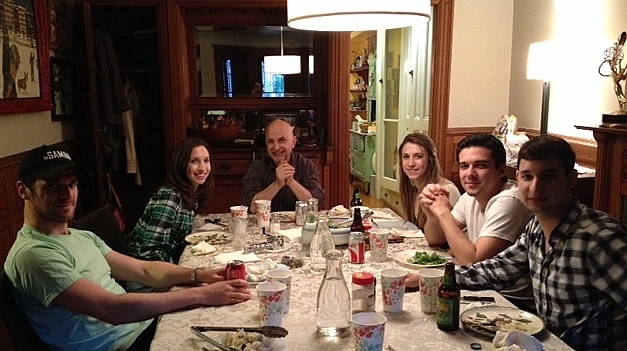 (The first family we swapped with even left some Kraft American cheese!!) We couldn't believe that while we were indulging in the most delicious cheese and bread ever, the French families had "enjoyed" what I consider the lowest common denominator of American food. And so, faced with a loaf of white bread and whole milk (which I never use, preferring to chew my calories), I made the only prudent decision -- to transform the leftovers into a delicious bread pudding. 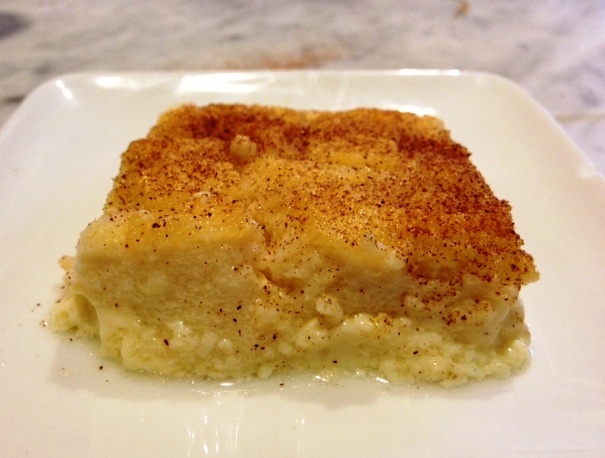 This is the bread pudding of my dreams, rich and custard-y. 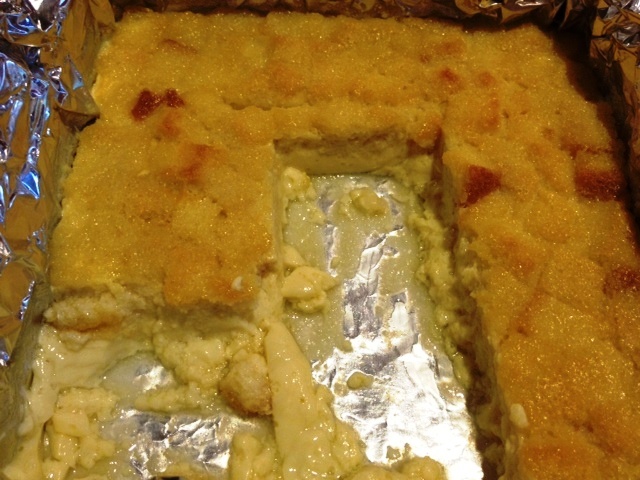 In fact, it was more liked baked custard than what we know today as bread pudding. 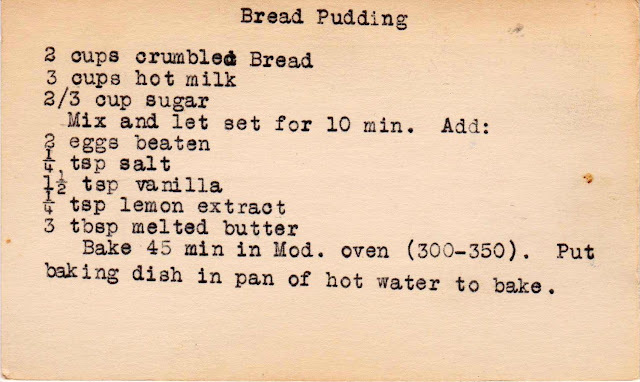 The recipe instructs "crumbling" the bread; most bread pudding recipes in the early- to-mid 20th century were were simply vehicles to "use up" stale bread. But the super-preserved supermarket bread in my refrigerator was still fresh, so I cubed it. It took about 3.5 slices to fill the three-cup measure. The bread cubes and sugar are placed in a bowl and covered with the hot milk for ten minutes. 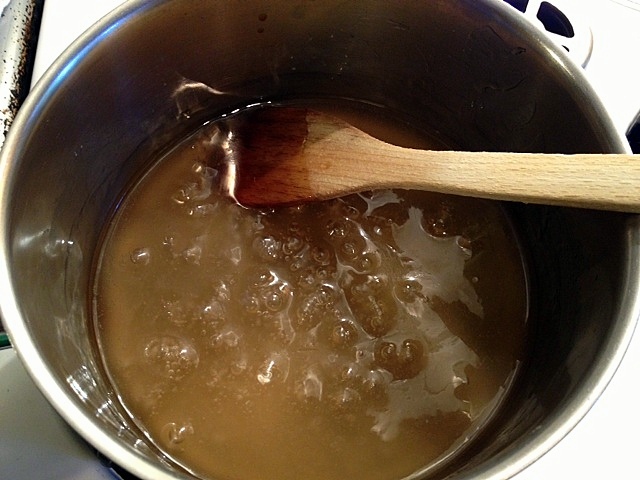 Two very well beaten eggs (below) are added to the mixture, along with salt, vanilla, lemon extract and melted butter. The batter is very liquid-y. Pour into an 8 x 8 (or similar size pan). I lined it with aluminum foil, mostly to save clean-up time. 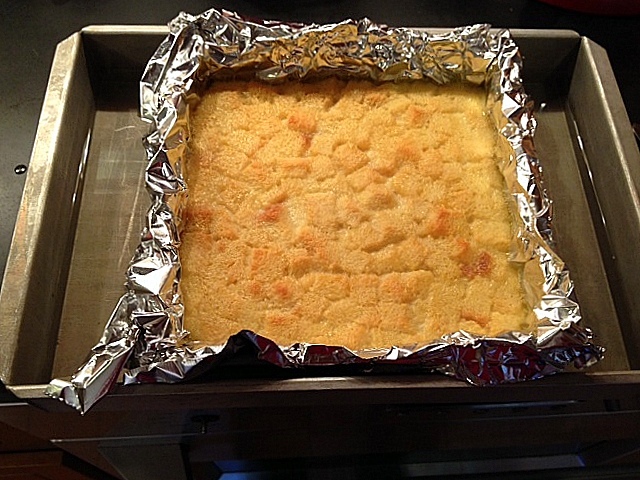 The bread pudding pan is then placed inside a larger one (below). 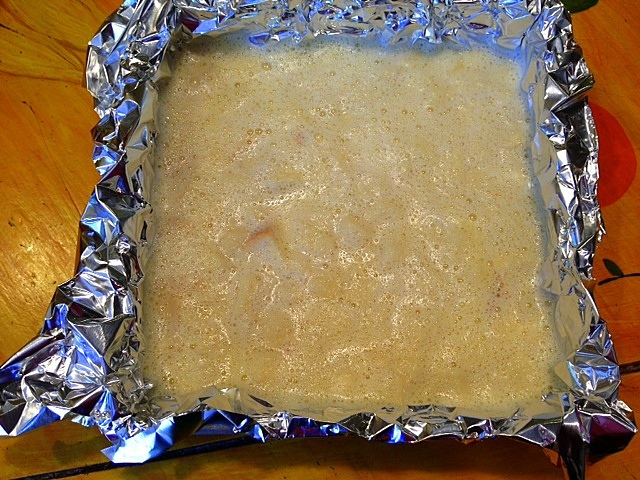 Add hot water to the larger pan (most easily accomplished after it is on the oven rack, to avoid spilling). This water bath helps the custard cook at a more constant temperature, insuring a better result. My custard did not come out perfectly, despite the water bath. (It is a bit weepy, which may be hard to see in the photograph.) I got "involved" with Facebook while it was in the oven and let it bake a bit too long. Still, it was delicious, even if the consistency was not absolutely perfect. I had to let this bake for over one hour, not the 45 minutes called for, as it was still quite loose at that point. The custard should jiggle a bit, but not be too firm. It will continue to bake as it cools in the hot liquid. Remove from the pan, plate and add a sprinkling of cinnamon on top for both appearance and flavor. And then, enjoy!